Whole Body Vibration: Does It Work? Athletes, “weekend warriors” and non-athletes alike are continuously searching for an “edge” on the competition, methods to get faster healing following an injury, or just a way to “shake things up.” Numerous “fads” and other modalities come and go, all promising a host of benefits. From carbohydrate loading to hyberbaric oxygen, billions are spent annually on the “next best thing.” One training modality that has got some attention over the last 10 years or so is whole body vibration training. We get asked about this a fair amount at SSOR so it’s time to talk about it. As with everything we do here, we look to the research to guide our practice. So how does vibration training work and is there any evidence showing its efficacy? Well, we’re not really sure yet. A couple mechanisms have been proposed. In the effort to not make your eyes bleed or put you to sleep, there are couple potential ways. First, the tonic vibration reflex may be activated better with vibration training. The muscle spindle, which causes contraction of muscle when stretched (this is essentially what happens when your doctor uses a reflex hammer on your knee), dampens vibration by causing muscle contraction. A second way is by increasing muscle cell sensitivity of muscle proteins involved in muscle contraction (Salmon et al, J Strength Cond Res 2012). There are two types of whole body vibration plates – vertical and oscillating. Oscillating is asymmetric, thereby causing more perturbations. This may be advantageous for balance work. Vertical platforms are under both feet simultaneously and move up/down. Vertical platforms also offer higher frequencies, and higher frequencies have been linked to better outcomes when used in training. Other proposed benefits of vibration training are that they don’t take up much space, less time is needed to get the benefit (as opposed to working out in the gym), it is safe, and there is less technical abilities required to do vibration training. Essentially, even the most non-athletic or uncoordinated of us can do it safely without much risk of injury and still procure benefits from it. What’s the research say on whole body vibration? Osawa et al, J Musculoskelet Neuronal Interact 2015 – Also a meta-analysis. Researchers found greater improvements in leg extension strength and countermovement jumps under identical conditions than those without whole body vibration training. Sitja Rabert et al, Cochrane Database Review 2012 – Cochrane reviews are basically a collection of meta-analyses and reviews on a specific topic. These are also fantastic resources for finding the best evidence-based information on a topic. Here, investigators evaluated the effect of whole body vibration training on neurodegenerative diseases like Parkinson’s and MS. At this time, there is insufficient evidence on the effects of gait, balance, function, and strength in individuals battling these conditions. Manimannakorn et al, J Strength Cond Res 2014- a meta-analysis on long-term effect of whole body vibration training on jump height. Of 15 studies included, vibration training produced a moderate to large increase in vertical jump height. Specifically, authors noted that protocols with higher frequencies, higher amplitudes, longer exposures per session (>10 mins), and longer training periods (>12 weeks) had the greatest benefits. Marin & Rhea, J Strength Cond Res 2010 – a meta-analysis on power increases after vibration training. Of the 30 studies analyzed, it appears vibration training can improve chronic power adaptations, with a trend towards vertical platforms having better results. A recent study by Ronnestad et al in J Strength Cond Res in 2012 found no effect on 1RM squat in powerlifters, but it appear to help increase acute power output. Marin & Rhea in J Strength Cond Res 2010 did a meta-analysis on muscle strength similar to their previous meta-analysis on power. Of 31 studies, vertical platforms tend to help chronic strength adaptations, while oscillating ones help w/ more acute strength increases. Additionally, there were trends towards women having better effects than men as well as untrained athletes. Kosar et al, J Strength Cond Res 2012 evaluated the effect of vibration training on muscle soreness after exercise. Researchers found that it appears to help attenuate muscle soreness, but it might be compliment to other modalities. They also added that we but we don’t know if it’s best before or after. Well, we can’t deny that there appears to be some evidence showing that it can help. Positive trends have clearly been demonstrated on a number of clinical measures. Therefore, we cannot simply discount whole body vibration training as a useless training modality. We’ve talked to some professionals that use them regularly while others say it’s now a coat rack in their facility. The “pros” of vibration training are basically what we said above – space-friendly, low technical abilities needed to perform it, and they are safe. The “cons” however are that they are expensive and it’s a rather “passive” treatment. When using it, subjects are basically standing in place. 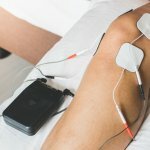 There are numerous other alternatives to increase strength, power, balance, and other clinical measures that are grounded in sound scientific knowledge. We just don’t know yet how exactly vibration training works, who it’s best for, or what parameters are the most optimal to realize gains. All that said, if there’s some extra money laying around or you want a “big wow” purchase, you certainly can waste money on other things. However, you shouldn’t be under any delusions that it will be a “magic pill” to make an athlete heal faster or have substantially better strength and/or power. We just have more to learn on whole body vibration at this time. It would be a privilege to serve you or answer any other questions you may have about your own or a loved one’s training methods. Rest assured, we’ll shoot you straight!